Healthy, simple and quick to put together. This is my kind of recipe! I learned this recipe from my Turkish mother in law. There are a ton of tabouleh recipes out there. The one ingredient that makes this recipe stand apart from others is the pomegranate molasses. It adds such a nice tang. This dish is so simple and delicate in taste, so please make sure to use only the freshest ingredients. Such a simple and lovely salad! 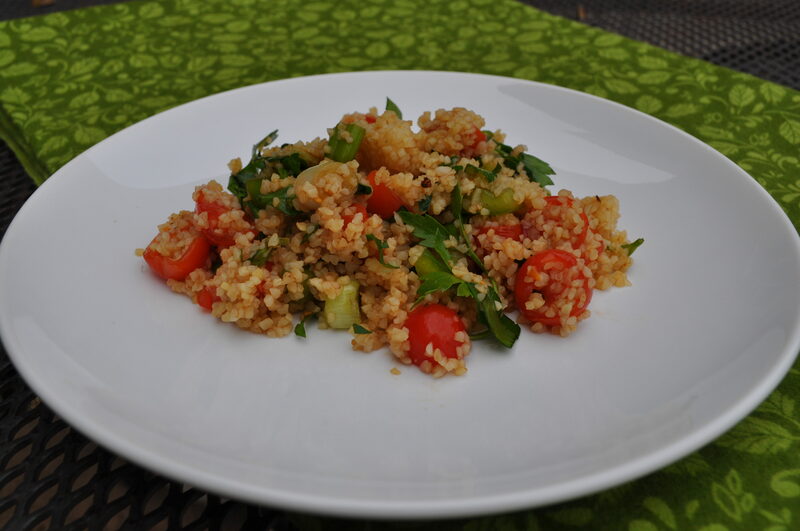 I once tried this with quinoa instead of bulgur and was happy with the results. Your Tabouleh looks great! My Turkish mother's recipe includes chopped dill pickles and hot salsa. Sounds disgusting and isn't very authentic, but tastes delicious! Interesting! Maybe I will try that sometime! What are some of the other Turkish foods that you eat? My mother in law makes really awesome dolmas too. We like borek too. My mother in law makes our with spinach and mushroom. Comes out great! I love her baklava too because she does drown it in sugar like the store bought ones. Post the dolma filling recipes!! I would love that. I spent some time in Turkey and I love Turkish food!!! I need to get her over here to help me make them. Her dolmas are so good! She is coming to watch my kids on Thursday and I will ask her again. I haven't had them in awhile. Can you suggest any alternatives to the pomegranate molasses? I am not sure what to use in place of it. Maybe a drop or two or pomegranate juice? The recipe would still be great even if it is omitted.